Who will Devour Spock First: Google or Microsoft? Yesterday I received my Beta invite for Spock, a new personal search site that claims to offer a smarter alternative to searching for people than through regular search engines like Google. Tim O’Reilly recently posted a very comprehensive blog entry, “Why I’m so Excited about Spock”, marveling at the ability to gather information on people from Wikipedia and social networking sites like LinkedIn and Facebook. Spock also lets users contribute to the results area for people found through search. You can add tags of your own, vote existing tags up or down to strengthen the associations between people and topics. You can also identify relationships between people (friend, co-worker, etc. ), upload pictures, and provide other types of information. In theory, this sounds lovely. Sites like Zoom Info and Freebase don’t have these kind of features, and although the concept of users collectively contributing information on individuals was already pioneered by Wikipedia, you can’t search for “drug-related death” and find results that are as current as what you find in Spock. As people add, remove, and modify tags on celebrities and everyday people, (in theory) the more detailed and (hopefully) factual search results will be. In theory. Like any Beta, there is still some work to do. Take my experience, for example. Hmm. I don’t seem to exist anywhere. However, if you search for me in Google, I believe the first thing that appears is my IMDB profile, my blog, a byline from MTV News, and my Friendster profile. 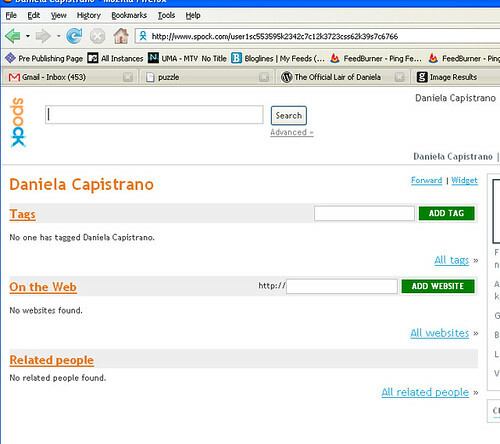 My Friendster profile is displayed, but that is all. Not only that, it lists my age as 26 which is WRONG. hmph. Your profile results and search results should at least be in sync. I tried searching for my mentor Angela Morgenstern. She is a well documented producer/strategist/visionary for both on air and digital, and if you do a Google search on her about a million things surface (ok not that much, but you get the idea). I was confident that her various keynote appearances, interviews, company profile pages, etc. would be displayed. Wrong. The only thing that appeared was her LinkedIn profile, along with her gender and location (not correct). So, the ideas behind Spock seem practical, in that it would be nice if I was a student wanting accurate information on a politician, celebrity, or historical figure… But how do I feel about random people adding tags for me? I may be able to modify them, but how often am I really going to be checking on that? Will Spock notify me when people modify the details of my search results? The idea of having to constantly correct the inaccuracies of my online presence seems tiring and annoying. And now that I think of it, the functionality behind Spock seems like something any major search engine should already be offering. Why should comments I made in message boards in 1998 surface before something from this year?